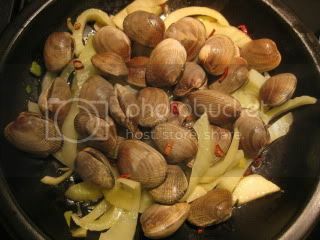 I love cooking and eating clams, and while I always love the simple sake-steamed clams, I also do different recipe variations. This time, since I cooked them with fennel. When fennel soaks the rich broth which is infused with clam juice, it tastes really good. 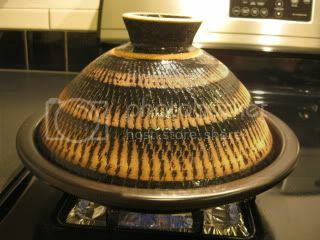 For this dish, my tagine-style donabe, "Fukkura-san", is the perfect cooking vessel. It's a very simple recipe, yet it makes a beautiful presentation and tastes really great. Here's how I make it. 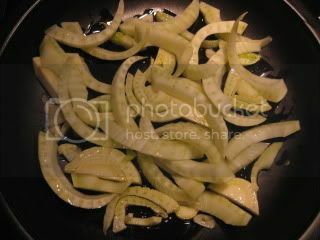 Saute thin-wedges of a fennel bulb with 1 clove garlic (thinly-sliced) in 1Tbsp olive oil in Fukkura-san for a minute. Add 2T water, cover with lid, and steam-fry until the fennel is tender for 7-8 minutes. Add 1.5 pounds of clams (rinsed) and 1tsp sliced dry chili. Add 2T sake and cover again. Cook until the clams are open. Add 1/2T fish sauce (nan pla) and a small handful of basil leaves (torn by hand). Squeeze some lemon. Stir and turn off the heat. Serve immediately. So delicious. 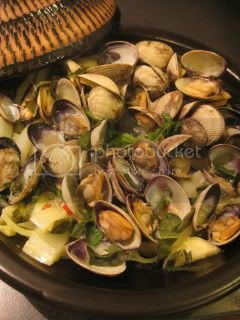 Clams are so meaty, fennel is tender, and the broth is really flavorful.